Single Stone Pendants are perfect for any occasion. Receive the healing and positive energies from these crystals while fashionably accessorizing. Pendants can be customized with your choice of stone depending on your energetic preferences. All pendants can be created with gold or silver wire, and come with a matching chain. 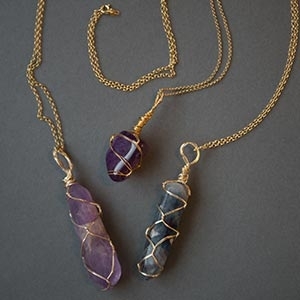 Make your chakras chic with these one-of-a-kind Horizontal Wraps created by Jamey Kahl. Fashionably displayed, these creative designs will bring positive and unique energies to the wearer, emitting powerful vibrational energies. A Custom Wire Wrapped Design is a unique handmade piece of wearable art. Often combining several crystals into a single design, each pendant is one-of-a-kind and never duplicated. These custom designs are the perfect statement piece to any outfit, as well as create positive and healing energies for the wearer.